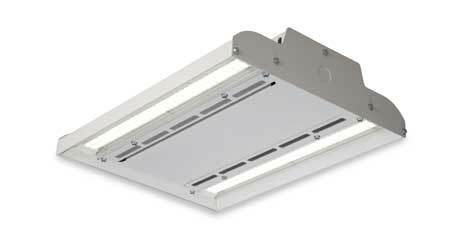 The Albeo ABV-Series is the company’s latest high bay LED luminaire. Using a new form factor, the ABV-Series is designed to meet recommended luminance and illuminance requirements for high bay and low bay applications. The design accommodates one or two modules with two LED strips per module, and has a combination steel and aluminum housing. The ABV-Series lens system enables LEDs to provide optimized illumination for open floor and racked aisles with photometric distributions of 55, 90, and 120 degrees.